Location: Catalina Island, off the coast of Southern California. Terrain: Desert like, sand trails. Some road walking, lots of ridgewalking. 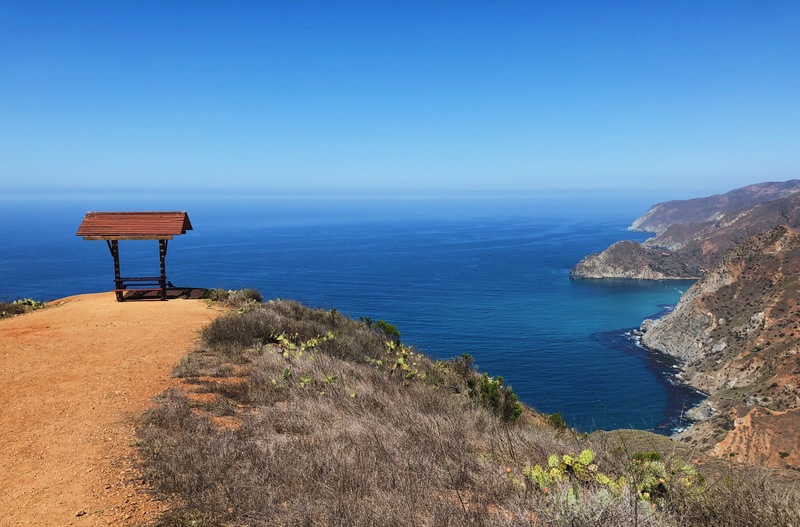 Most hikers finish the Trans-Catalina trail in three to four days. The trail is 36 miles long. Parsons Landing is the finishing point for northbounders, and when hikers reach this point they have to hike back 6.5 miles to catch the ferry back to the mainland, so the trip often totals around 42 miles. The TCT has several campsites along the trail with amenities for hikers, including potable water and bathrooms. 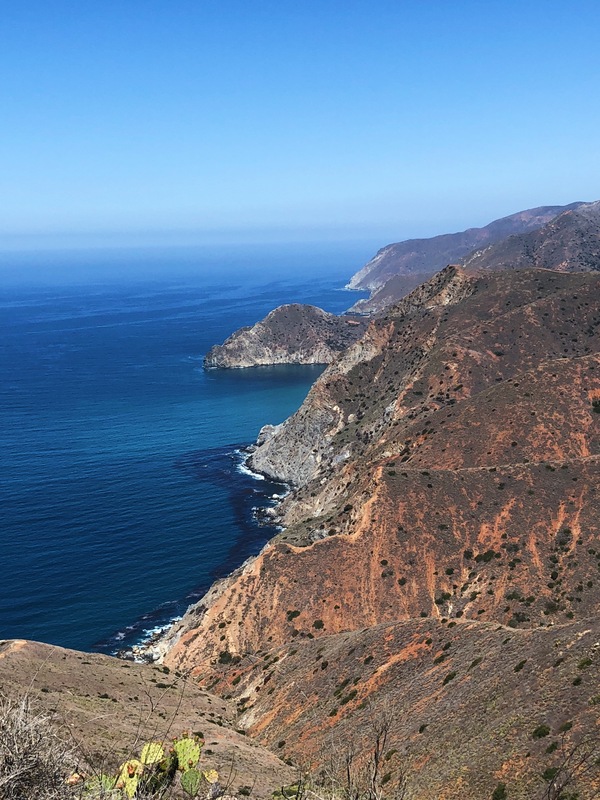 The Trans-Catalina Trail is absolutely stunning. The only time I’d heard of Catalina Island is on step-brothers, talking about the Catalina Wine Mixer. Recently I saw a tourism ad for backpacking the trail on the Bring Me Instagram page, and I was hooked. The trail offers unbelievably gorgeous ocean views, similar to the coast that I’ve seen in Jamaica and Mexico. The water is bright blue and many of the campsites offer front-row ocean views, which means falling asleep to the sounds of the waves. Does it get any better? Ocean views off the coast of Santa Catalina Island. This hike will also have you trekking through areas of thick vegetation. 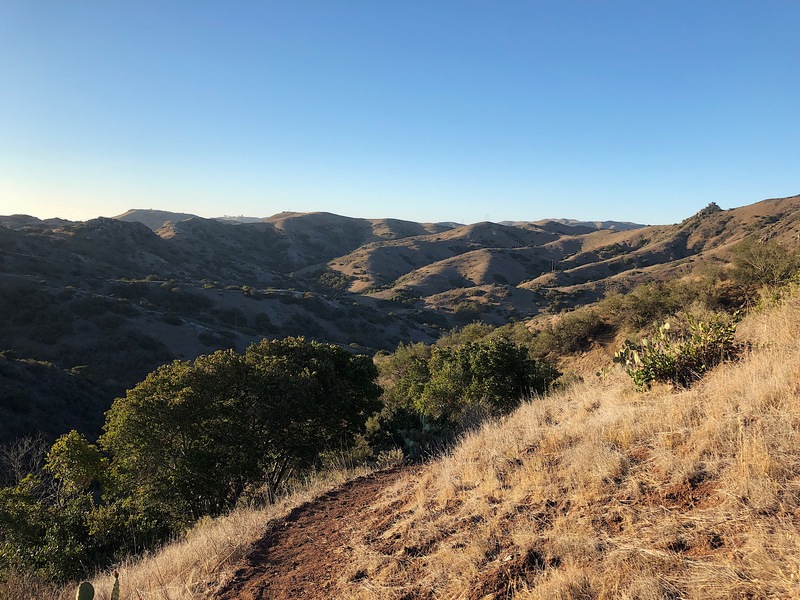 These areas felt similar to hiking through the desert section of the Pacific Crest Trail, with sandy trail beneath my feet, the sun beating down on me, and signs warning hikers of rattlesnakes. Speaking of the sun, this trail offers almost no shade (I’m not kidding), which is why the best seasons to hike it are fall or spring. I hiked the trail in June, and although the temperature said it was only around 75 degrees Fahrenheit I could’ve sworn it was around 100 degrees. I left the trail with plenty of new tan lines, including a sweet chest-strap tan line from my pack and sunburns, but it’s all part of the beautiful process of thru-hiking. Packed up and ready to go. I departed from the San Pedro port. The three ports in the Los Angeles area that will get you to Catalina Island are located in San Pedro, Long Beach, and Newport Beach. 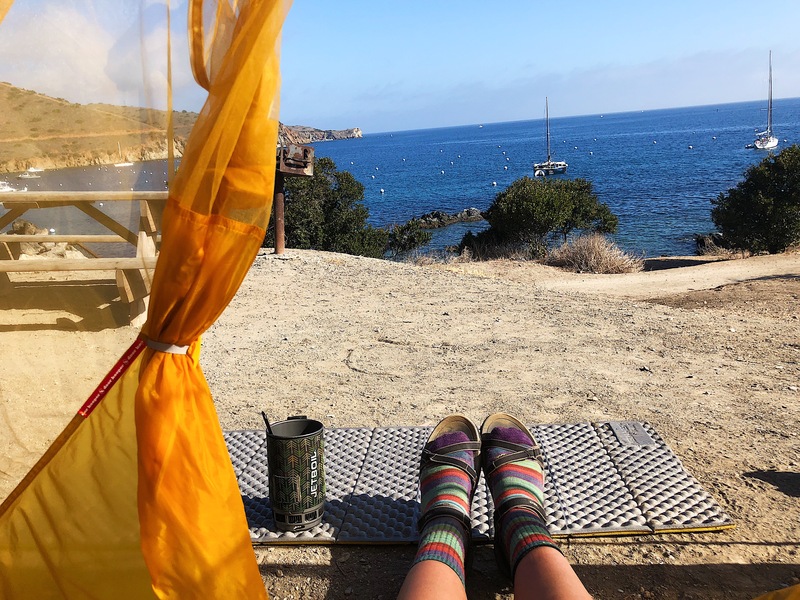 There are two docks on Catalina island that visitors can access the ferry: Avalon (the city on Catalina Island, where most hikers begin their hike and the most popular tourist destination), and Two Harbors (where most hikers take the ferry back to the mainland). 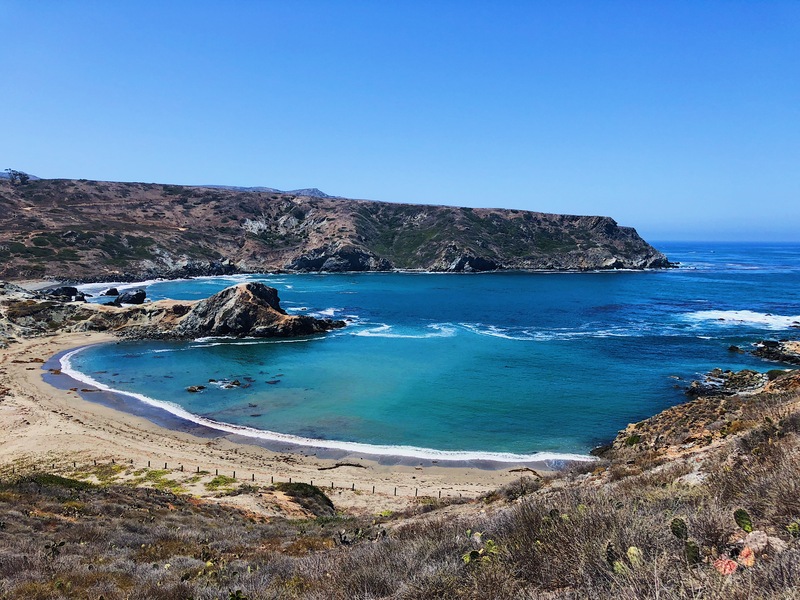 San Pedro ($73 round-trip): Because I hiked the trail southbound I took a ferry from the San Pedro port to begin my trip. The San Pedro port is the only port that accesses Two Harbors. So if you are thru-hiking the trail and have to leave your car during your hike, this port is your best bet. Long Beach ($73 round-trip): This port has the most time slots available and seemed to be a busier port than San Pedro during my time of travel. This port only takes passengers to Avalon, so if you are thru-hiking the TCT, you cannot access the Two Harbors dock from this port. Newport Beach Port: This port has a discount option available from Groupon, for a $45 round trip instead of a $73 round trip from the other ports; however, because it does not take passengers to or from Two Harbors I never went to this location. 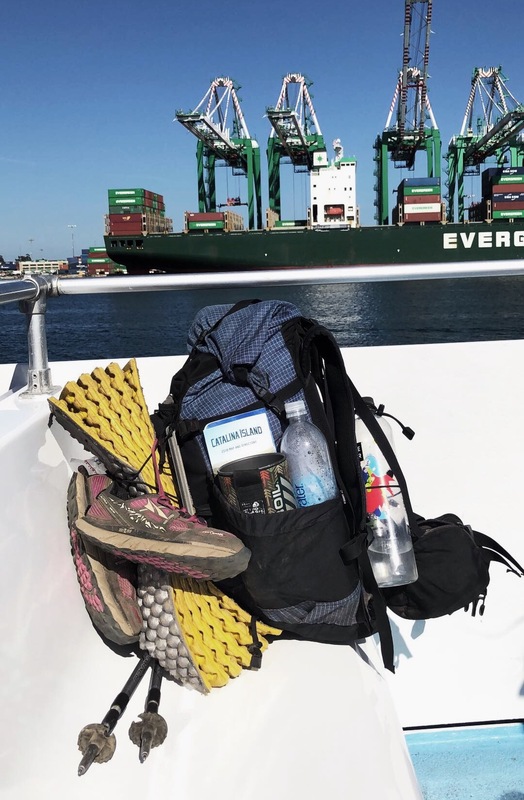 Once completing the hike, hikers who follow the northbound route have to hike back to Two Harbors from Parsons Landing to catch the ferry back to the San Pedro port, as there is no ferry to Parsons Landing. This trail is rich with amenities. It offers several stops along the way with restaurants, including the Catalina Airport and Two Harbors. I stopped into the airport where I had a burger and waited out some of the heat of the day. The staff was very welcoming. Each of these locations also have gift shops for souvenirs. There are also several stops that offer water and bathrooms, including Haypress Recreation Area (between Hermit Gulch and BlackJack Campground) and each campground has potable water and most offer the option to have a fire. You don’t have to hike more than six miles without a source with potable water. Sweet deal, right? A simple little kind of free. 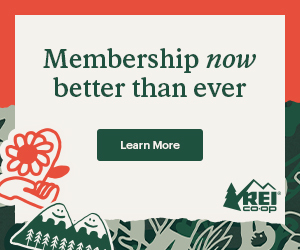 Campsites require prior registration, which you can do online or in Avalon or at Two Harbors when you get there. Almost every campsite has bathrooms, potable water, most times a fire pit, and some have oceanfront views. You’re not really dirtbagging it on this trail. Each campsite is between five to ten miles of the next, so you never have to travel far without water. Parsons Landing (mile 36) → between $18 and $24 a night, depending on the season. Parsons Landing is known to have some of the best campsites on trail. Largely in part due to sites directly on the beach. This campground has only eight sites available, so booking well in advance is recommended. Sites offer fire rings, some picnic tables, and bathrooms and potable water. Two Harbors (mile 29) → between $25 and $28 a night, depending on the season. Two Harbors campground also offers sites with oceanfront views; the sites are located on a cliff overlooking the ocean. Two Harbors is the most town-like place on the island other than Avalon, with cafes, stores, and options for several excursions. Two Harbors is the only other option (other than Avalon) for hikers to catch a ferry to or from the California coast. This campground offers fire rings, picnic tables, bathrooms, and potable water. There are several sites available here. Little Harbor (mile 22) → between $18 and $24 a night, depending on the season. 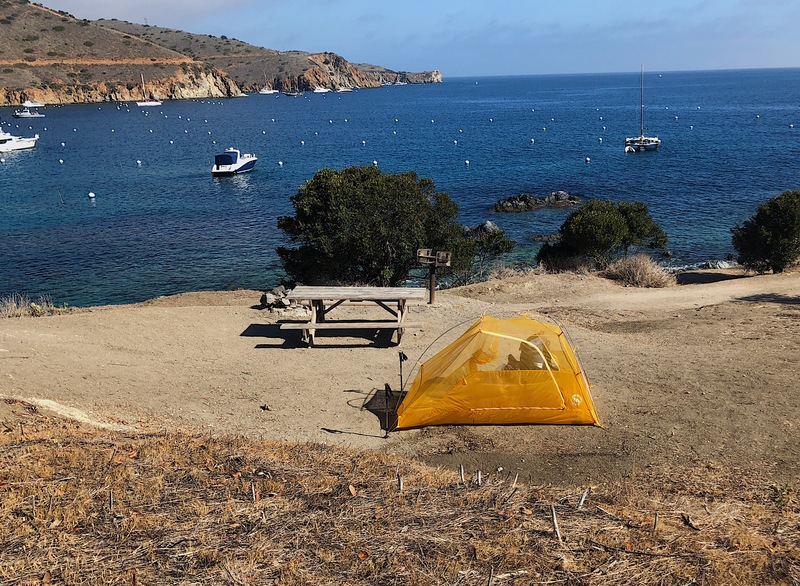 Little Harbor is a more secluded campground than Two Harbors. It still has sites with ocean views, just not as scenic as the other two. There are several sites available here, and the campground offers fire rings, potable water, bathrooms, and information posted about the trail for hikers. BlackJack Campground (mile 10.7) → between $18 and $24 a night, depending on the season. BlackJack is the only site that doesn’t allow hikers to have a fire. This campground is in the middle of the island and boasts vegetation and spacious sites. Some of them are equipped with a picnic table and there is a shower option, but it’s really just a lifted spout with cold running water. There are several sites here as well as bathrooms and potable water. Hermit Gulch (mile 1.7) → between $25 and $28 a night, depending on the season. This place seemed to be buzzing with tourists when I was passing through. It’s the only campground located within the city limits of Avalon and has several campsites available. Sites seemed spacious and the campground offers bathrooms, potable water, and allows hikers to have fires. This trail is harder than I thought it would be, but I am also not in the best shape of my life at the moment. There are steep climbs, particularly during the second half of the trail, and there is almost no shade. Moving from from BlackJack Campground to Two Harbors (again going northbound) has several smaller (one to two miles), steep climbs along the way. After the initial climb out of Hermit Gulch Campground, the remaining hike to BlackJack Campground is the easiest part of the trail, in my opinion. A lot of the time you are hiking on a ridgeline, and almost always hiking through open mountains. Although hikers are usually trekking through the sand on this trail, there is some road walking involved. A herd of bison blocking the trail. I never saw a rattlesnake, but I did see about 30+ bison. On my trip to Two Harbors, a girl who was living on the island told me that years ago a movie was being filmed there that featured bison, and so the filmmakers shipped them there. After the film was over the crew apparently couldn’t round up all of the bison, so they inhabited the island. They aren’t too intimidating. They do stand right on the trail, but as I walked closer they backed away. A little intimidating as a solo female hiker, but I reminded myself that this is a popular trail and I’d hadn’t read of hikers getting stampeded (is this a word?) by a herd of angry bison, and I made it out just fine. In addition to the bison I saw several large squirrels and a few foxes and deer. Ah, the beautiful sight of wild animals in the wilderness, it really was a joy. I did, however, wake up on day two to holes in my tent from a little creature, so beware. I did not encounter any bugs that were a nuisance during my hike. All in all, this trail was absolutely amazing and I would do it again. I would pick a different month to do the trail as it was very hot. I would rate this trail for intermediate to advanced hikers, but also beginners would be able to break this hike up into three to four days and complete it no problem. With all of the amenities available on the trail, it is safe and a great trail to start out with. Check out the Catalina Island Conservancy for more info. Hey- just so y’all know- you get the ferry for free on your birthday! I think you can stay a couple days although I never did. Also a lot of the local businesses will hook you up- everything from free mini golf to ice cream to burritos.